Charles Duane "Charlie" Baker, Jr. (born November 13, 1956) is an American businessman and politician. He is the 72nd and current Governor of Massachusetts, since 2015. He was a cabinet official under two Massachusetts governors, spent ten years as CEO of Harvard Pilgrim Health Care. He was also the Republican nominee for Governor of Massachusetts in his unsuccessful bid in 2010. ↑ Miller, Joshua (8 January 2015). 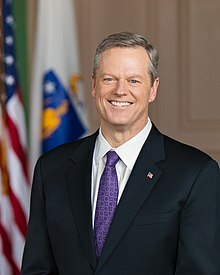 "Charlie Baker takes over as 72d governor of Mass". The Boston Globe. Retrieved 9 January 2015. This page was last changed on 22 April 2019, at 14:34.